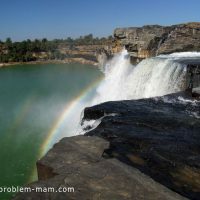 Chitrakote Falls, 50km from Jagdalpur in Bastar district, are in a horseshoe-shaped gorge on the Indravati river, and affluent of the Narmada. 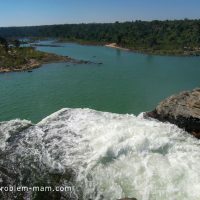 At 30m high they are India’s biggest falls and have been called “India’s Niagara”. Although they are only a third as wide as their Canadian counterpart, they are just as impressive. 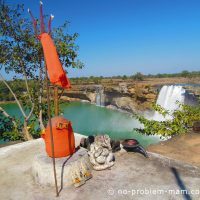 In winter, when the river’s flow is slower, a boat will take you to the foot of the falls. 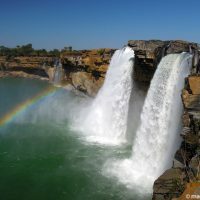 It’s not unusual to see a rainbow forming against the misty spray of the falls, adding to the magic. On the left bank is a small Shiva temple and several natural caves called “Parvati’s caves” (Parvati is Shiva’s consort). 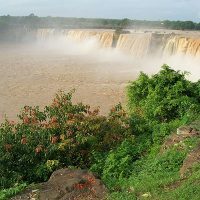 The beauty of the Chitrakote Falls can be seen all year round. 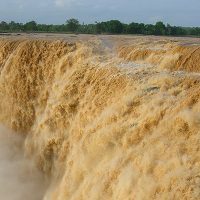 From July to October, during and after the monsoon, the falls are fierce and wild; their brown waters fill the whole gorge. Go in winter, from November to February, if you want so see them when the water is blue and limpid-clear. An ideal place for a contemplative halt.